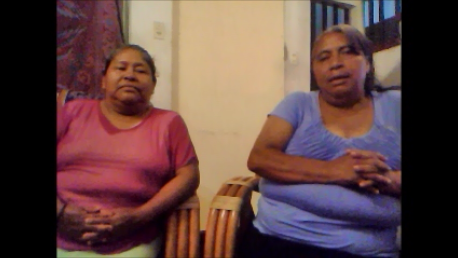 Conchita (left) and Aldina (right) share their early Sister Parish memories. How do you remember Sister Parish’s start in Guatemala? Aldina: In 1980, a man named Richard Fenske arrived with his wife to our community, La Esperanza, with intentions of studying Spanish, but after being in the community they realized that there was a great lack in health services. Mr. Fenske at that time was working on bringing groups to Guatemala through Sister Parish, but had not brought one yet. At that time I was attending the health workshops of his wife, Barbara, with other women from the community. The workshops taught us how to properly care for our children and included other health topics. At that time in my life I had an alcoholic husband and was an abused woman. Later, myself and other women joined Ricardo [Richard Fenske] in receiving the first group from Sister Parish to Guatemala. If I am correct, UPAVIM was first linked to a Lutheran church in Minnesota. We began to work and little by little other groups and communities became involved. We realize that being in Sister Parish has changed us in many ways. The ability to share your life stories, the sad and the happy parts with someone is transforming. All the friendships that I have gained are built in the sharing of faith and sometimes have served as an escape from some of the problems I was experiencing in different periods of my life. I love sharing with other communities in faith and walking in solidarity. This is because I was an abused woman and a woman who people discriminated against. I have had an opportunity to meet wonderful people like Barbara and Ricardo. There are people who only speak in their dialect here in Guatemala, and through this organization I have been able to come to know their struggles and lives. How has Sister Parish changed the ideas that you had about foreigners? Aldina: I have realized that foreigners have the same hopes and aspirations. They also, like us, have the need to search for the things in life that will strengthen them and help them to become better people. I truly believe that our relationships are based on pure friendships. Money is not everything, it is a necessity but it is not what drives our friendships we have. Our relationships are driven by faith, love, and solidarity. Another aspect that has changed the way people think is that we have had the opportunity to go to the United States. Through those experiences we have learned that there are also problems in the United States like there are here. So we know that our brothers and sisters have also made sacrifices to come and visit us here in Guatemala. How has Sister Parish affected your family? Aldina: I can remember my daughter playing on the steps while we where having Sister Parish meetings and she would make drawings for everyone. That made me very happy to see because many times our children do not interact with people as they should because of the violence in the communities. So when someone new would come it was an adventure for her and my other children. As an adult she still remembers it and is thankful to Sister Parish for having those fun memories. Conchita:My daughter has built relationship with other people in La Esperanza that she may not have had without Sister Parish. Sister Parish is a organization that brings people to together to share and it builds lasting friendships that my children still have and cherish today. What will you remember most about Sister Parish? Aldina:I will always remember that I have tons of friends all over the United States and El Salvador. For example, right now I am having a tough time in my life. But I know that I have many friends in the United States that are praying for me. Conchita: I will always remember that people from another country came to my country to share their time and also the word of God. To me that is something very beautiful to be able to share from the heart. To find out more about UPAVIM, go here. Aside | This entry was posted in 25th Anniversary, General, Guatemala and tagged 25th anniversary, upavim. Bookmark the permalink. I remember sharing a water bed with Doña Concha in Eileen Speilman’s house in Bemidji, MN when a group from UPAVIM visited their sister community in 2000!! I also remember going to the opening of the new UPAVIM building back in 1993 and feeling very proud to be part of this hermanamiento – the women had organised the building by themselves, with support and solidarity from their sister church (and other organisations) and it wasn’t something that was done for them. ¡Adelante hermanas!